ON THIS DATE (October 9, 1999) ... Minus Nomar Garciaparra, who sat out because of his sore right wrist, the Sox extended summer for at least another day with a 9-3 swatting of the Cleveland Indians, who lead the best-of-five American League Division Series, 2-1, but couldn’t close out a team whose only certifiable superstars, Garciaparra and Pedro Martinez, were on unscheduled shore leave. Garciaparra’s stand-in, Lou Merloni, jump-started two rallies, Ramon Martinez pitched gallantly for nearly six innings, and slugging John Valentin overcome his second ghastly throwing error in three games by delivering two big hits: a tie-breaking home run in the sixth inning and a tie-breaking two-run double in the seventh. Rookie Brian Daubach, who had promised there was still a little magic left in the Belleville Basher, followed Valentin’s bases-loaded ground-rule double with a three-run home run to make the seventh a five-run inning. 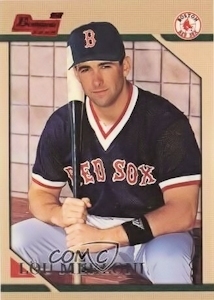 Merloni would drive in the sixth run of the inning three batters later. Valentin, who was hitless in his first 10 postseason at-bats but drove center fielder Kenny Lofton to the track in the fourth, came up in the sixth and launched one that even Lofton couldn’t retrieve, a 409-foot home run into the triangle that gave the Sox a 3-2 lead. Then, in the very next Indians at-bat, Valentin fielded a grounder and bounced another throw in the dirt, allowing Lofton to score the tying run. As lifts go, however, it was tough to top the one the Sox received from Ramon Martinez. Ramon gave up a run in the fourth on singles by Jim Thome and Harold Baines and a sacrifice fly by David Justice. He left to a standing ovation in the sixth, an ovation that would have been sweeter had he been able to hold onto a 2-1 lead. But the Indians pushed across the tying run before he left on a double by Robbie Alomar, an infield out, a walk, and a fielder’s choice. Martinez, who struck out six and allowed just five hits while throwing 96 pitches, was saluted as much for his gallantry and grace as his excellence.